Agaricus blazei is also named Jisongrong, Xiaosonggu, Brazil mushroom and ABM mushroom in China, belonging to Agaricus genus, Agaricus family, Agaricus order, hymenomycetous class and basidiomycetes subphylum. It is originally produced in Brazil and Peru. In 1965, Japanese Brazilian gave the spore culture to Japan as a gift, and the culture was put to artificial production successfully after several years test. The commercial cultivation began more than 10 years later. In fact, it is the close relative of Agaricus bisporus. It has a thick fruit body with cap diameter of 5-11 cm. The cap looks like a hemisphere at beginning, and forms the shape of steamed bread, finally is flat on top center, with fibriform squama of hazel to chestnut on the surface and veil pieces at the cap edge. The context at cap center has a thickness of 11cm with thin edge and white color, and turns slight orange yellow when hurt. The gill is sejunct, dense and has a width of 8~10mm, turns from white to flesh color, and black brown at last. The stipe is columned and solid in center, with length of 4-14 cm and diameter of 1-3 cm. The stipe is consistent or expanded at root, near white on surface, and turns to near yellow after touched by hand. At beginning above annulus there is little squama of powdery or cotton pieces, finally turns flatness. The annulus is bigger, above position, like membrane, turns from white to slight brown. Brown tailpiece with cotton pieces shape is under the membrane. The spore is wide ellipse to oviform, and no bud hole. The mycelia have no clamp connection. It is a kind of saprophyte occurring on the grass with animal ordure in summer and autumn, requiring high temperature, wet and ventilate environment. This mushroom mainly utilized the crop straws, such as rice straw, wheat straw, corn straw, cottonseed shell and so on and sawdust as carbon resource; the bean cake, peanut cake, wheat bran, corn flour, ordure of domestic animals and birds and urea, ammonium sulphate as nitrogen resource. According to the study, Agaricus blazei can utilize sucrose and glucose, but not solubility starch; can utilize ammonium sulphate, with the optimum concentration of 0.3%; can also utilize ammonium nitrate, but not peptone. The mycelia can grow at a temperature range of 10-37°C, and the suitable temperature is 23-27°C. The fruit body can occur at a temperature range of 17-33°C, and the suitable temperature is 20-25°C. The optimum water content of the substrate is 55%-60% (the ratio of substrate and water is 1:1.3-1.4). The optimum water content of casing soil is 60%-65%, while the air humidity of mushroom house is 75%-85%. No light is needed for mycelia growing, and a little shimmer is of some help to the forming of fruit body. Agaricus blazei is a kind of aerobic fungus, and it needs plenty of fresh air for both mycelia growth and fruit body development. It can grows in the substrate with pH of 6-11, and the optimum value is 8.0. The cultivation technology of Agaricus blazei is similar to that of Agaricus bisporus. The mushroom house is the place for the mushroom growing and developing, so suitable environment should be set up for good quality and high yield production of this mushroom. The house can be modern mushroom house, plastic mushroom shed, simple plastic shed and free house. According to the situation of mushroom house, multi-layer bed or ground bed can be adopted. If using the nature temperature, the proper season should be arranged for cultivation. In Beijing area, the cultivation is arranged generally from the end of spring to autumn. The fruiting begin about 40 days after inoculation, at this time the room temperature should be controlled at 20-28°C. If using vegetable cellar or green house, the year-round cultivation can be done. In the place with suitable temperature and humidity or forest region in south area, the bed can be built on the ground with shed and wind break, and the cultivation is arranged based on the proper temperature and humidity and the local climate. Agaricus blazei also has three degrees of spawn, i.e. stock spawn, pre-culture spawn and cultivation spawn. The PDA medium (flayed potato 200 g, glucose 20 g, agar 18-20 g, water 1000 mL) is adopted generally. The preparation method is: weigh up 200 g flayed potato, clean with water, cut into pieces with size of 1-2 cm, add water, heat and keep boiling for 15 min, avoid over cooking. Filter with 4 layers pledget, add 18 g agar to the filtrate, heat to thoroughly melt the agar, again filter with 4 layers pledget. Add 20 g glucose to the filtrate, dissolve completely, load into the tube before solidification, with the loading volume is about 1/5 of the tube. Then stuff up the tube with cotton plug, autoclave at 1.1 Kg/cm2 for 30 min. Move out of the autoclave, cool for a while, incline the tubes before solidification. Inoculate the tube with good quality stock spawn, and a stock can be transferred to about 30 tubes. Culture at suitable temperature, the mycelia will overgrow the tube in 7-10 days. The sawdust medium (sawdust 77.5%, rice bran 20%, sugar 1%, gypsum 1%, lime 0.5%, water 120%-130%) is adopted generally. The preparation method is: dissolve the sugar in a little water, weigh up the sawdust, rice bran, gypsum and lime and mix well, add the sugar solution into clean water, and pour into the materials mixture, at the same time mix completely. Then fill the substrate into the bottle, clean the mouth and outside of the bottle, stuff up the bottle with cotton plug, autoclave at 1.5 Kg/cm2 for 2 hr. Those stock spawn growing well and no contamination are chosen for inoculation, and a tube can be transferred into 4-6 bottles in restrict sterilization operation. Cultured at suitable temperature, the bottle will be full of mycelia in 3-4 weeks. The grain (including wheat, rye, broomcorn, millet and so on) medium is adopted generally. The preparation method is: purify the grain and clean with water, add 17 Kg water into 12 Kg grain, keep boiling for 15 min, continue soaking in the boiling water for 15 min, get rid of the water and slightly dry in the air. 11 Kg cooked grain is added with 120 g gypsum and 40 g calcium carbonate mix well and fill the bottle, autoclave at 1.5 Kg/cm2 for 2 hr. The pre-culture spawn of growing well and no contamination is chosen for inoculation under restricts sterile condition. Cultured at suitable temperature, the bottle will be full of mycelia in 3-4 weeks. The sugarcane residue is the most suitable material for Agaricus blazei cultivation. One or mixture of the materials such as rice straw, wheat straw, cottonseed shell, couch grass, reed, corn straw and so on can also be used, with assistance of cattle ordure, horse ordure, birds ordure and a little chemical fertilizer. Dry and fresh materials are generally preferred. The following formulas are supplied as reference. (6) Rice straw 80%, beef manure 14%, gypsum powder 35, lime powder 3%, urea 0.6%. 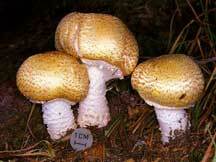 The composting and fermentation of Agaricus blazei is the same as that of Agaricus bisporus. The materials such as rice straw, wheat straw and cottonseed shell are saturated with water; scatter the assistant materials such as ordure or domestic animals and birds to each layer of the composting. In general the composting has a top wide of 1.2 m, bottom wide of 1.5m and height of 1.3 m. The inner temperature will reach 70°C 3-4 days after composting. To determine the temperature, the columniform thermometer should be inserted 33 cm deep into the compost. The compost temperature will decline 5-7 days later, and turning the compost should be carried out. The purpose of turning is to improve the air condition, emit the waste gas, and adjust the moisture of the compost. At the same time, supplement the fertilizer and gypsum powder, improve the fermentation condition, enhance the growth and reproduction of microorganism, promote the temperature raising, fasten the decomposition of the compost, and result in thorough maturation. In the first turning, add the chemical fertilizer such as urea, ammonium sulfate and so on and mix well, and they will be changed into suitable nitrogen resource by microorganism. The second turning is done 5 days later, and the addition 5 times turning will be done every 4 days followed by 3 days, totally about 24 days. To make the compost uniformity, the inner compost should be turned to outside and the outside should be turned to inner when turning. After fermentation the compost is brown and snapped easily by hand, and the water content is about 60%-75%. Hold the compost tightly with hand and 2 or 3 drops water can be seen falling down from the finger gaps. Adjust the pH value of 9. The turning is very important in the preparation of consistent, complete maturate and good quality compost, which is the key point for high production in Agaricus blazei cultivation. The indoor bed and field bed both can be used in the cultivation. The bed of 3-5 floors is built indoor, and the compost is spread on the bed consistently, not too lax or tight, with thickness of 20 cm. After loading bed, close the entrances and intakes, suffocate with formaldehyde and potassium permanganate (formaldehyde 8-10mL and potassium permanganate 5g per m3) or sulfur for 24 hr. exclude the chemicals and plant the spawn when the compost temperature is declined to 28°C. Begin spawning when the compost leveled up, no ammonia in the room, and the compost temperature stabilized below 28°C. Now the grain spawn is mostly used. Broadcast the grain spawn equably on the compost surface, about a bottle spawn of 750 mL per square meter, at last cover a layer of compost containing more manure. Flat the compost surface with a board after spawning. Take care of the temperature and humidity especially in outdoor cultivation after spawning according to the air temperature every day. On the sixth day after spawning, sprinkling water if the compost surface is dry, and ventilating once every day generally. In indoor cultivation, the temperature change should also be noticed, not only the temperature and humidity should be kept, but also the indoor air should be exchanged. In field bed cultivation, interpose the bar made of bamboo or wood at both side of the bed to form an arch and cover the plastic film, and the spawn will grow and develop in the microclimate. The temperature in the film should not exceed 30°C, if the temperature is too high uncovering the film and declining the temperature should be performed and the relative humidity should be kept no less than 85%. (1) The action of the microorganism in casing soil will stimulate the fruit body forming. (2) After casing, the air exchange decline on the compost surface, the CO2 produced by the mycelia metabolism cannot emanate well, which change the ratio of oxygen and CO2. The CO2 with a certain concentration will promote the fruit body forming. (3) After casing, a relative stable microclimate can be kept in the compost and soil, and the soil always contain plenty of water, so the fruit body will occur continuously under the condition. (4) The stimulation from casing soil and sprinkling water to the mycelia both promote the fruit body forming, and the casing soil can support the fruit body. No casing, no fruit body. The casing soil should have good ability for water keeping and air exchanging, and the hard sandy soil is not suitable for casing. In general the field soil, peat soil and man-made soil (the river soil or pond soil is added with cattle manure and lime powder, fermented for 1 month with pH value of about 9) can be used. One day before casing, adjust the soil water content of 70%-75%. The spreading mode of flat or saw tooth both can be used in casing soil. The latter means covering a layer soil of about 1cm on compost surface firstly, every 10-15 cm making a soil ridge with width of 10cm and thickness of about 3-4 cm. The management in fruiting phase is to create better condition for improving the quality and production of Agaricus blazei, so the measures should be adjusted based on the local conditions. It should be done as the following, to hear the weather forecast, make sure if it is overcast, sunny or rainy and if there is the attack from high temperature or cold current, to look the temperature and humidity, and the size, density and appearance of the mushroom, to feel the moisture of casing soil, to smell if the air is fresh in the mushroom house, to check the growth situation of mycelia, the humidity of casing soil and the harmfulness from disease and insect. Under suitable condition, it needs 40-50 days from spawning to the mycelia thoroughly colonizing the compost. If it grows fast, only about 25 days may be needed for button forming. The white button appears on casing surface, and grows to a size of soybean, about 3 days later develops to a diameter of 2-3 cm. At this time stop sprinkling water to avoid dead and deformed mushroom. Here the mushroom will consume plenty of oxygen and exclude CO2, so the ventilation should be pay attention to especially in fruiting phase. At the same time the soil humidity should be noticed and the air humidity in mushroom house should be kept in 85%-95%, which is the most important key step in the water management. 8 days is needed for each flush mushroom, and about 15 days is needed for mycelia growing between two flushes. After harvesting each flush mushroom, clean the bed and supplement water to make ready for next flush fruiting. The whole fruiting phase will last 3-4 months, and harvest 4-5 flushes mushroom. The fresh mushroom production of indoor bed cultivation will reach 10 Kg/m2, while it is 3 Kg/m2 in field bed cultivation. The mushroom should be harvested when the cap is not open, with canary surface and fibriform squama, and the veil is not broken. If harvested over mature, the gill will turn black and reduce the product value. The fresh mushroom harvested can be processed by fresh keeping, salting, dewatering and drying for market, or processed and packed according to the customer’s requirements. Agaricus blazei has the ability resistant to weed mould, and it will not be hurt in general. The key point is to ventilate often to avoid over wet in the house and on the bed in a long time. The weed mould and insects appear at the about time of casing, and can be killed by blowtorch burning at beginning. Sulfur suffocating or some high-efficiency and low toxicity chemicals can kill the mushroom flies, acarids and wireworms found in mushroom house.